The PHP includes only single inheritance that means a class can be extended only one single class using extended keyword. The OLD name of PHP is - Personal Home Page. 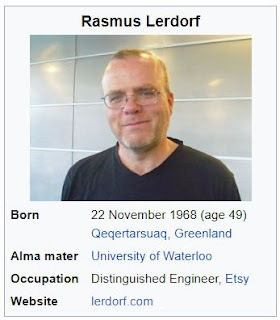 The father of PHP is - Rasmus Lerdorf. The $name is variable whereas $$name is reference variable like $name=Anil and $$name=Singh so $Anil value is Singh. The $var is a variable with a fixed name. $$var is a variable whose name is stored in $var. The PEAR stands for PHP Extension and Application Repository. The PEAR is a framework and repository and used to create the reusable PHP components. It's also provides a command line interface to install "packages" automatically. What Is PDO classes in PHP? The PHP Data Objects (PDO) extension defines a lightweight, consistent interface for accessing databases in PHP. It is also data access abstraction layer, so no matter what database we use the function to issue queries and fetch data will be same. The scripting engine that powers PHP is called Zend Engine. What are differences in between PHP4 and PHP5? The PHP4 doesn't support OOPs concept and it’s using the Zend Engine 1. The PHP5 supports the OOPs concept and its using the Zend Engine 2. How can we display the output directly from the browser? The tags <?= and ?> is used to display the output directly to the browser. The function include () OR require () are using to include a file to a PHP page. What Are the different type of errors in PHP? ü Parse Error – Commonly caused due to syntax mistakes in codes. ü Fatal Error – These are basically run time errors which are caused when you try to access what can’t be done. ü Notice Error – These errors occurs when u try to use a variable that hasn’t been declared. ü Warning Error – These occurs when u try to include a file that is not present, or delete a file. What Is the differences between include and require function? The require () function - The file is required, If file not find - throw Fatal error. The include () function - If file not find - returns warning not error. How many data types are there in PHP? How many Types of Array in PHP? The “ksort” is used to sort an array by key in reverse order. What does $GLOBALS means in PHP? The $GLOBALS is associative array including references to all variables which are currently defined in the global scope of the script. The in_array() function is used check the values are exists or not in the existing array collection. What does $_SERVER means in PHP? The $_SERVER is an array including information created by the web server such as paths, headers, and script locations. What does $_FILES means in PHP? How To Retrieve a Cookie Value in PHP? How can we encrypt password in PHP? The md5 (), sha1 () and base64_encode () functions are used to encrypt the username and password. We can encrypt the password to a degree with md5 () and the md5 () function would be the best. Example - As for encryption i would personally use md5 () and a salt. What Are the differences in explode () and str_split () functions? The str_split() function splits a string into array by using the regular expression. The explode() function splits a string into array by using the string. What's a header () function in PHP? The header () function is used to sends a raw HTTP header to the client browser. How to set HTTP header to UTF-8 using? The Session is a super global variable that preserve the data across subsequent pages. The Session uniquely defines every user with a session ID and its helps to managing the web apps. The session_id() returns the session id for the current session. How can we destroy a session in PHP? What Is cookie in PHP? The Cookie is a small piece of information that stored in the client browser and also used to identify a user using the information stored in their browsers. What Are differences in ID and class in CSS? The ID can be used to identify one element but class can be identifying more than one. What Are differences in unset() and unlink() function in PHP? The isset() function is used to checks, the variable is defined and not null. How can we submit a form without using submits buttons? The GET and POST are used to submitting a form. What are predefined classes in PHP? What are magic methods in PHP? The Magic methods always start with “__” and Magic methods are member functions that are available to all the instance of class. What's use of __sleep and __wakeup in PHP? The __sleep returns the array of all the variables than need to be saved, while __wakeup retrieves them. What Are the difference between $message and $$message? The $message stores variable data and the stored data can be fixed while $$message is used to store variable of variables and the stored data may be changed dynamically. How can I execute an anonymous function in PHP? How To send an email In PHP? Send an email in PHP using the mail () function and It contain five parameters - $to, $subject, $message and $headers. The $message and $headers are optional parameters. The \034 is octal 34 and \x34 is hex 34.